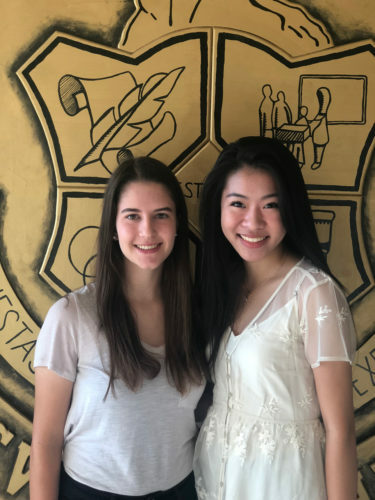 Clarksville Academy has two seniors, Cheyenne Deibert and Christy Zheng, who moved from Semi-finalists to Finalists in the 2019 National Merit Scholarship Program. It is an incredible achievement to be named a National Merit Scholarship Finalist, as only 15,000 students nationwide receive this honor. They will continue to compete for National Merit Scholarships. The 30th Annual Steak Dinner will be held on April 13, 2019 on Procter Court. Tickets are $85 and will go on sale this week. Reservations can be made by visiting: https://clarksvilleacademy.com/steak-dinner/. Reservations and tickets can be made online or by contacting Kari Turner in the main office 647-6311. Tickets must be paid in full for reservations to be valid. A limited number of sponsorship opportunities are also available for the event and can be secured by contacting Sally Allen at sallen@clarksvilleacademy.com or by using the number above. This year we have had a Rob Hendon original donated to Steak Dinner. For a chance to win this painting, patrons may make a $25 donation and be entered to win. Donations can be made in the front office. You do not have to present to win. Drawing will be made the night of the event. Anthony Taylor Productions will record the Steak Dinner performance this year. Flash Drives with the performance on them are available for pre-order at $25 each. Please contact Sally Allen to purchase yours. Clarksville Academy will be on Spring Break the week of March 25-29. Enjoy this time away to relax and recharge! CA’s Summer Camp schedule will be online very soon. Summer Camps are for all ages and not limited to CA students. If you would like to discuss offering a summer camp, contact Sally Allen at sallen@clarksvilleacademy.com for more information. All Items in the Cougar Store are 50% off! If you say you saw this in the newsletter, you will get an extra discount at check out. Go Cougars!!!! In the last few weeks, Clarksville Academy has received some wonderful gifts from donor families. Dr. George & Katie Lee have graciously purchased a new AED machine for our campus. This device will allow us faster response time if we have a student or staff member in need. Bill & Kerri Mace donated the materials and labor to build an addition to our baseball facility at the Sports Complex. This new facility will feature a 30X30 foot weight room and a 50X85 foot hitting facility. This will enable us to add 3 full-length batting cages, a full weight room and turn our current facility into a pitching lab. The entire project is donated by the Mace family. Jon & Christina Clark recently donated lights to be used in the hallway of the main building. These lights have already brightened this space so much! CAPA (Clarksville Academy Parent Association) purchased new tiles for the hallway and these will be installed in the coming weeks. We can’t thank these families enough for their continued support of Clarksville Academy and our programs. If you have an interest in supporting Clarksville Academy, please contact Sally Allen at sallen@clarksvilleacademy.com to find out more about how you can help.